We finally broke away and the holiday we had been preparing for arrived just in time. It was quite a struggle of persuasion with guile to get my good friend of 30 years to agree that we need to spend some quality time together away. Something substantial beyond the times snatched on the phone or when we met up for short meals whenever our paths crossed in London. I had not been since December 2010 and I was quite looking forward to it, my friend however, was wishing I had forgotten or some other circumstance would crop up that it would never happen. At best, he wanted to go away for a week, at worst, a week’s holiday for me was no holiday that in the end, I booked 11 nights, and yet, I almost did not hear the last of it because 10 days was the halfway point, as if you could go away from 10 and a half nights, anyway, this is for the record, because, it would be referenced when next I need to tackle reticence and reluctance towards getting away. He arrived from London, we had a quick meal at my apartment and they made off to the airport. Though he would not believe it, I do suffer a few privations when I go on holiday alone, but when with company, I try to ensure there is nothing, if anything to complain about. We first encountered the facetiousness of a Thomson Holidays check-in clerk who was particular about my hand baggage weighing 6.8kg when it should according her be just 5kg, we lightened my hand baggage by transferring some things into my friend’s luggage. I later did a search on the baggage restrictions of Thomson Holidays and found that the weight restriction applies to checked-in baggage, but it is dimensions that applies to hand luggage. If there is a rule, it is unwritten, but enforced under duress at a point where one does not have the means to argue the case with evidence. I was not pleased. We fast-tracked through security, though I noticed there was no rigorous border checks either on our way out in Manchester or at our point of entry at Las Palmas de Gran Canaria airport. Not that our fast-track was anything like it, two families with kids ahead of us were as disorganised as you could have a troop of people that the normal paced security checks seemed to go through briskly. Then we settled in the airport lounge for the less than two-hour wait for boarding. Though boarding seemed to happen on time, we were held at the gate for another 20 minutes and it was 30 minutes beyond schedule before we took off. The safety announcement appeared on the screens on the backs of the seats we faced, it was a girl probably lip-syncing the safety instructions with other kids demonstrating all the safety procedures. It was funny, entertaining and well, serious too. The screens then returned to a repeating cycle of holiday offers besides which we suffered sensory deprivation for almost 4 hours unsure of where we were, how much long our flight was or if there was anything to observe even if it was a night flight. When I asked the air hostess about getting some entertainment on my screen, she said it was not a service offered on their short-haul flights. Now, that threw me because a typical film would run for two hours or thereabouts, the flight from Manchester to Las Palmas de Gran Canaria was of a 4 hour 10 minute duration. Checking Wikipedia for the skinny on flight lengths, short-haul flights last less than 3 hours, medium-haul flights up to 6 hours, long-haul up to 12 hours and ultra-long-haul flights are over 12 hours. Then the definition becomes obfuscated that a short-haul flight can be limited to 500 miles (800 kilometres) or for UK Treasury purposes, it is an absolute flight distance of under 2000 miles (3600 kilometres). Then, I realise the subtle technicality that Thomson Holidays has liberally adopted for the purpose of passing off the required Air Passenger Duty £138 per passenger as a discount amongst other things. The distance from Manchester to Las Palmas de Gran Canaria is just 1,877 miles (3379 mile). The travesty and perfidy of it all. I had arranged to be picked up from the airport rather than take the Thomson Holidays shuttle service which from past experience has me delivered to my hotel last, after travelling round Maspalomas and Playa del Ingles discovering where all the luxury hotels were. Yet, it took well over an hour for our luggage to hit the conveyor belt because we arrived when luggage handling shifts changeover, something I thought could be better managed with an overlap so as not to inconvenience passengers at the end of a long flight that kept them at the airport beyond 1:00AM. We got to our hotel just before the crowds arrived, were booked in and basically, the holiday has begun. Rest, relax, rejuvenate and recuperate. The Nigerian military has put itself in a rather difficult position of needing support whilst not being quite trustworthy. Too many times they have put a spin on stories that have turned out to be outright lies. Their engagement with the Boko Haram militancy in north-eastern Nigeria has exposed fundamental rank and file deficiencies in the forces from low morale to not being adequately equipped to handle the insurgency. The nursery rhyme at the start of this blog almost fully illustrates the almost futile exercise of winning anything until a radical reform of our whole military apparatus is put in place. Sadly, I do not think many well-meaning Nigerians are convinced that this regime has the will, mien or wherewithal to get this done as determined purposeful exercise, a stunt or a fluke. When they were up, what we have read of is a scorched earth policy of pillage and massacre, extra-judicial killings and lawlessness, many of these highlighted by civil rights groups that there is very little to differentiate what they have done with war crimes. When they were down, it has been barracks sacked, mutiny against generals, being under-equipped against the absurd but worryingly sophisticated tactics and weaponry of Boko Haram, soldiers let down by their generals, unnecessarily martyred as if sent into battle with their guns stopped or hands tied behind their back. The soldiers are brave because of who they are, not because of example and character exemplified by the military brass. It is a shame. At the same time, Boko Haram declared an Islamic caliphate in Gwoza, the region where they have held sway, and even though the area is under a state of emergency, they act with impunity and writ large, the Nigerian authorities literally unable to project power and unchallenged sovereignty. The Nigerian military have rejected the claim, but actions would matter much more than words. Ruefully, until we see something different, we have an alternative and illegal power in control in the north-eastern Nigeria. Back to the nursery rhyme, it appears they’ve gone up the hill and down again, and now that they are only halfway up, they are neither up nor down. There does not seem to be plan, purpose, aim, strategy or any conceivable idea as to how the Boko Haram menace would be arrested and dealt with. The Commander-in-Chief was ensconced in Germany on some personal retreat away from the chaos of Nigeria does not seem to be a general at war, rather he fiddles like Nero as Nigeria burns, proffering empty platitudes to the realities that Nigerians under the cosh of terror face, literally oblivious of things when buried in the cosy cocoon of Aso Rock – it is both a travesty and an atrocity. The truth is we are shamefully and inadequately NOT winning this war against Boko Haram, no fanciful pronouncement would take away from the fact that the Nigerian forces are down and fearfully, maybe out too. Continuing on the subject of my walking, I chose to walk towards the east of Manchester, the temple of Manchester City Football Club, Etihad Stadium and the SportCity area where the 2002 Commonwealth Games was hosted. Having lived in Manchester for almost 6 months, I have only just begun to explore its environs. In fact, I have never been this far before and I only once walked in this direction when I was looking for an apartment, the adventurous self in me preferring not to return the way I went out. My bearings are a mess though, because there times I have assumed roads or paths would lead to places I know, but almost never get there, a bit or perambulating and gallivanting, minutes almost counting the hour, I find that slither of salvation, a place I know and I am thankful I have not had to tell anyone that I am lost. My walk took me down the Ashton Canal towpath where I saw a lady at the helm of canal boat wending its way upstream with her partner and a friend operating the water locks. I saluted her with the greeting, el Capitán as we struck up a conversation about her boat, where they were going, how the water locks work and some other small talk. They had had the boat for two years and they were going up river to have it serviced. Meanwhile, they were in their third day of this journey from home wharf for dry dock, fascinating stuff. I then helped in swinging the gates open and shut before I continued my walk. Soon I was at grand walkway to Etihad Stadium, I had one quick take before I returned to the steps from the canal scaling the double-steps up and running down the single steps, creating a bit of a pant and a workout before continuing on to Philips Park. Philips Park, named for Mark Philips, the local Member of Parliament was open in 1846 after he committed himself to obtaining an open and free public space for the common man. The River Medlock runs as brick-lined culvert through the park, so done because of the floods in 1872 that disinterred bodies and washed them downstream. The river could easily be mistaken for drainage, well, it is not. There are serpentine paths all around the park with sections for children, cycling, rugby and other sports. 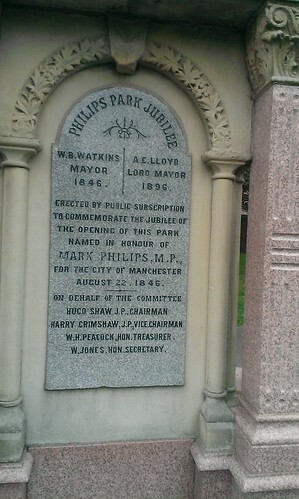 It has memorial gardens and beyond the main park is the Philips Park Cemetery which opened in 1866. As I walked through the park, I saw a boy of probably not yet 13 years of age sat on a bench smoking, he had ridden into the park on his bicycle and found a secluded spot to engage in this vice. Soon, I walked into the cemetery where he definitely was not following his mother's advice by choosing to talk to strangers. Precociously, as he asked for how to get to the nearest tram station and I averred that I was new to this place, he wondered if I knew where I was, I had to use Google maps to point him in the right direction. In the cemetery, I observed many things; the quiet and stillness, a stillness in spirit, in mind and in body that is rest. Yet, rest must not be an end, it must become part of the cycle of life and living, the opportunity we seize to get away from it all, the rat race and the hustle and bustle of chaotic living. I recognise that in Africa we rarely visit cemeteries apart from when we put the dead to earth, I discovered that in England, cemeteries are so well kept, a job managed by the Friends of Philips Park Cemetery and they do provide quiet places for contemplation away from any disturbance. I eventually connected with this mind-set. The cemetery had sections for the burial of Church of England, Roman Catholic, Jewish, non-Conformist (English Dissenters) - whatever that means and so on. It was like our beliefs usually handed down from our ancestry follow us through life whether we adhere to them or not and those beliefs decide where we are laid to rest. I would probably return to my Church of England roots than look for anything else. One thing you could not miss in the cemetery with the power and the presence of love, many tombstones with the phrases, “In loving memory of”, "The dearly beloved", "The loving husband, wife, son, daughter of" with the day they died and at what age. There was one tombstone that thanked the lady for being a wife of 53 years, in love and more, I was moved. The fact is in death, whether we mean it or not, love appears to conquer all. Death is where resignation and acceptance meat at the ritual of ashes-to-ashes and dust-to-dust, when the dead are gone, they are gone, we bury or cremate them and keep the fond memories of them in our hearts and minds. Leaving the burial ground, I returned to Philips Park to find out more about the park, and found a Peace Memorial that had a prayer written by Marianne Williamson but often attributed to Nelson Mandela, wrongly spelt with a double l.
The picture I took had a family who would have no idea what memorials are about clambering over it and it was clear that this activity by many other Philistines as these had damaged parts of the beautiful artwork, I was saddened and close to being angered. This time, I walked back the way I came, quite refreshed and enlightened. I wonder where next my footsteps would take me. The other pictures. Being the non-conformist that I am, even though I have free use of a gym as part of my apartment block, I am so not used to the regimented use of gym equipment much as I would love to begin to sculpt aspects of my physiology. I have biked, cross-trained, rowed, walked, pulled weights, lifted weights, done crunches and much else, but there is no fun in enclosed places with you alone as the motivator. Instead, I decided to take to walking around Manchester, this is strange because I normally use a cane, yet if I wear trainers and walk quite briskly, the need for a cane is somewhat obviated. The situation is that the normal walking pace, the formal shoes and my gait, whatever that is, somewhere between a dawdle and a catwalk goes to my lower back with excruciating pain, I have at times had my much lighter partners stand on my back just to ease the pain. Then, I cannot run because there is just not enough cushioning in whatever shoes I choose to wear to take the impact of my feet hitting the ground, I have always suffered from medial tibial stress syndrome (shin splints), so walking, it is. I have been walking for anything between 90 minutes and 2 hours, enough to break sweat and get my heart racing, all of which I think is healthy and useful. Then, I found an App on Google Play called StepWalk Pedometer, that allows me count my steps by recording the vibrations of my feet hitting the ground as well as charting the course of walk. Since I started using the App, I have averaged 7,500 steps daily, and the most I have done is over 11,000 steps in the space of just under 2 hours. In the process, I am discovering Manchester and getting to see interesting places, some of which I would cover in subsequent blogs. The good thing is if I do decide to walk in the daytime, I have use the canal towpaths, however, at night when I have done most of my walking, I have to keep to well-lit roads and well away from cemeteries before my wildly vivid imagination gets the better of me. I think walking is a good thing, the kilograms are not falling off like bricks, but there is some noticeable effect, I am sleeping better, resting well, I don't get tired that easily and with a diet that has slightly changed to eliminate excess and appreciate more natural things, it would take time, but the journey to a healthier me has already begun, one step at a time. From the 1990s, I have attended quite a few gay prides, people of difference and diversity united in common purpose of living and letting live. This celebration of our humanity and acceptance has always attracted me because it speaks to the kind of thinking I have, that all can live in peace together if we accept and respect each other. In London, Amsterdam, Berlin, Paris, Playa del Ingles, Vienna, Zurich, Antwerp, Brussels, Cologne, Hamburg and many other places I cannot remember, I have watched streets fill up with crowds young and old, of all races, of all sexualities and of all beliefs to watch the spectacle, cheer on and have a lovely day. Never have I seen or witnessed a counter protest, but an engagement of fun that almost forgets the seriousness of what is being celebrated. The stranglehold of religion and Victorian values on our society with regards to what we consider moral or immoral has been lifted in most cases, many battles for equality won, but the war still rages in many lands where difference and diversity on the grounds of sexuality is criminalised. Today, the Manchester Pride march/parade passed right in front of my house, at first, I watch from a window, then stepped out unto the front porch of my building to watch and take pictures. The participants marching past as I stepped out was first the Suffolk Police and then the Greater Manchester Police, in full uniform and with a marching band, they were as involved as anyone else and at the same time I thought about the countries where the police is the enemy, the instrument of the state to persecute and prosecute difference on the basis of sexuality. Organisations, institutions, political parties, unions, companies, sports teams, hospitals, civil service groups, activities groups and many others marches past as certain even held up placards not forgetting where persecution persists, especially in Nigeria. For the very first time of attending a Pride march, I suddenly felt emotional and even shed a tear, to think of the country I live in, the freedom of expression, the celebration of diversity and the fighting for rights of others, it dawned on me the great privilege we have along with the need to keep speaking up for those who have no voice. More pertinently, the best message to my reading was on a placard, it read, “Love is not a crime”, who we choose to love, the partner being adult and with the choice and opportunity should never ever be the business of anyone else apart from those involved in that relationship. The ultimate pursuit of happiness is in finding love and celebrating it, and that is what I think the gay Prides are all about. Indeed, I would want more representation of ethnic communities and minorities, my surprise and happiness at seeing ladies wearing hijabs on the march, shows we are getting there. The Manchester Pride would run for 4 days and we are just on the second day. I know what pumps are and anyone male or female who wears high stiletto pumps betrays a sense of style regardless of the hobby or vocation that inspires the person to be so attired. On reflection, I really thought I knew what pumps were, only to realise that pumps derived from pompes which were originally worn by men and without a heel; they are shoes without fasteners, the back, sides and toe of the shoes being covered. Yet, one graphic about heeled shoes revealed a whole new world of heeled shoe knowledge that is just fascinating. The Kitten heel is low and full, the Mary Jane suggests a strap over the middle of the foot, the instep, the D’Orsay has the sides uncovered, the Wedge is a full heel without space between the heel and the ball of the foot. The Mule is like a heeled slipper, the Slingback is a strap at the posterior of the foot above the heel – the Achilles heel, the T-Strap is exactly what it is, then think of the design augmentations, Peep-Toe, Platform, Almond-Toe, Pointed-Toe and so on, which can be variations of shoe design. However, the one that gets me is the Heel-less Ankle Strap, and add anything to the end of that. Whoever walks in those is ready to break a leg. Lady Gaga sported one of those, but videos of people making heelless shoes for themselves means orthopaedic hospitals might soon have custom. To be honest, they look like cow hooves. I woke in the witching hour and suddenly felt my room was too small for me, so I moved into my living room which leads into my kitchen, a total of over 50 square metres and the walls appeared to close in on me. As I began to lose my options and my choices, the thought crossed my mind that I should leave my home, but another voice cautioned that if I did step out of my apartment, I would never return, I was being overwhelmed by a sense of claustrophobia that it was stifling. At that point, I did the only thing I knew to do, to call on my faith to rescue me from this situation as I had called on my faith a few months before, when my doctor gave me the choice of 5 weeks to live or recovery, depending on how I tolerated the treatment. Alone in my home, I began to say, “Jesus you’re my space, in you I am free.” I did not believe it at first, but I kept at it until I calmed down and with exhaustion I collapsed and rested sleeping on the carpet in my living room that night. My home was my sanctuary, it was my stronghold, I had lived in it for just over 8 years and it was where I yearned to return to when I left hospital after being suddenly hospitalised for 18 days. Yet, my home presented other dangers, some that crossed my mind not as suicidal thoughts but as possibilities I could explore to a conclusion and to an end. Yes, cancer stripped me of everything, from my health to my wealth, from my status to my standing, from my home and my security, it played with my sanity and my confidence, I could not pretend something about life was not happening to me. To my consultant, I appeared a lucid, eloquent and well-adjusted man, seemingly taking the knocks without appearing knocked about, but I had mastered the stiff upper lip that the quavering lower lip was literally invisible. People who had come through catastrophic loss due to ill-health were usually referred for psychiatric support, counselling and therapy to deal with what I eventually termed the long tail of cancer. I did not appear a typical candidate because I did not present the symptoms of depression, discouragement, despair, despondency or looming death, I had come to acceptance of the fact that life after cancer was going to be difficult and I had to live through it. Eventually, I had to speak up, in fact, I was close to breaking down when I told my consultant, I needed therapy. The psychologist did an assessment and thought I was fine, but I wasn’t, I needed to talk, talk to someone who could help me unravel the turmoil, the conflicts, the self-doubts and other things I did not understand. We adopted a freeform discussion format as the risk of losing my home came closer by the month. I had used the crude catharsis of writing to vent my spleen, speak my thoughts, expiate the hurt and much else, but it was not enough. My living room and kitchen had much light, the windows were big and went from one side to the other with very little walls between the panes. I could open the windows of my 7th floor apartment and breathe in the air that came from the harbours of IJHaven and ErstHaven in Amsterdam East, sometimes I entertained a thought, a crazy thought, one of possibility in the impossibilities that define us as men. I began to believe I could fly, yet another voice would tell me, it would be my last flight and the end of it would be unsightly. Yet, I had many reasons to think this way if I dwelt on where I have been, what I have done and things I have experienced. I was saved from the crushing blow of “Why me?” more times than I could care to mention. Deep within me was a story I wanted to tell and each time I wrote a story, many of which make up my blog of over 10 and half years I have desired so earnestly that wherever my story ends, I hope it ends well. I have never understood suicide, but it crossed my mind as a means to an end, much as I never understood pain until I felt the pain of cancer through 4 strong painkilling drugs that all I could do was laugh myself into delirium to ease the pain. What it taught me was there is pain there no one can understand, that can never be described, but it is real to the individual and it can drive that person so compellingly that nothing else matters but that moment. That becomes my daily prayer, never to ever get to a point where I have no other choice but the one to end it all. That is the reality of mental illness and God help us find the help to see beyond the now to a brighter day. Smarting from my encounter with Currys PC World, as a glutton for more punishment I went online shopping again for food through Hungry House. I typed in my postcode and I clicked on African cuisine and a list of 5 restaurants showed up, most of which serve Nigerian fare but only one of them was online, it was Spices African Restaurant and so I placed an order of various meals totalling £51 including delivery and I received a confirmation that my order was acknowledged and pending. A few minutes later at 19:18, I received an email confirmation that my order would arrive anytime between 19:40 and 20:25, at which point, I began to salivate with Pavlovian expectation. At 20:18, an hour after my order was placed, I received a phone call; I almost jumped out of my seat to get my order from the door when the caller asked who he was calling. Quite strange since he would have had the order and that was where he got my phone number from. I gave him my name as he asked if I have put an order to his restaurant through Hungry House, I replied in the affirmative and at that point he told me my order was to be cancelled because there was no one to deliver it. I was stunned. I remonstrated that having confirmed my order, it meant they had what I ordered and were able to deliver it, but he was having none of it as he told me to call Hungry House to cancel my order and seek a refund. At which point I asked if that was how he did business, but he was nonchalant. Angered and frustrated, I offered that Spices African Restaurant would not get a good review for this, to which he replied something to the effect that I could go and do my worst. I called Hungry House to complain since they are acting as the portal and escrow service to Spices African Restaurant and they were none too pleased. I was given a £5 voucher towards y next Hungry House order and my money would be refunded within the next 3 working days – a rotten inconvenience, but I am not finished with Spices African Restaurant yet. For the moment their account has been suspended on Hungry House like the other African Restaurants that might have been involved in sharp business practices as Spices African Restaurant, except for Tae’s Tavern which is currently undergoing refurbishment. Suffice it to say that Spices African Restaurant has probably gotten away with such rotten service without consequence or repercussion because no one pursues the matter beyond the exchanges on the phone, but I am having none of it. It saddens me that many ethnic businesses take a lax attitude to customer service and handle the importance of first impressions with levity, almost oblivious and unconcerned of the damage it can cause the reputation of their business and the loss of custom. As the business begins to fail, they attribute their difficulties to external factors when the problem is principally their attitude to cultivating respectful and considerate customer relationships. This is the stuff vendettas are made of, especially one that leaves a hungry man too angry to think of food until the blog is completed. Spices African Restaurant, you crossed the wrong man and you have not begun to pay dearly for this. Your spices are rotten, your Africanness is suspect and your service as a restaurant is a disgrace.